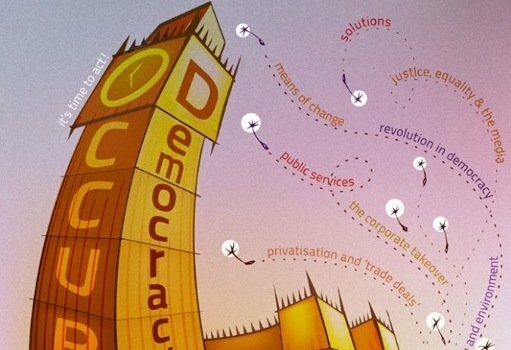 Occupy is back in London, UK, with a renewed focus on politics and an ambitious vision: to galvanise a mass movement for real democracy and establish a huge People's Assembly to debate a list of specific demands for radical political reform. This week, stalwarts of the Occupy Democracy campaign in Britain are continuing to stand their ground in Parliament Square. The heavy-handed police crackdown and evictions may have scuppered much of the plans for peaceful and creative demonstrations, but the re-emergence of the Occupy movement is a welcome sight in an increasingly unequal, stressed and disaffected city of London. The goal of the new Occupy campaign is laudable and significant: to direct energy from current single issue struggles into “a critical mass that can radically challenge the corrupt unrepresentative [political] system”. Initially staged in solidarity with Hong Kong’s ongoing civil disobedience campaign, the aptly-named #TarpaulinRevolution aimed to galvanise a mass movement for real democracy by transforming the Square into a civic space where activists can re-envision and rethink the fundamentals of our society, not only through protest activity but also with a programme of talks, workshops, community assemblies, music and theatre. One of the talks on Friday by John Hilary of War of Want particularly resonated with these themes, and emphasised the necessity for the emerging ‘movement of movements’ to move beyond reactive protest and articulate a collective vision of change. Drawing on the concluding section of his recent book, Hilary outlined what he terms three principles of convergence that indicate a means for moving beyond neoliberal capitalism and towards a better world: popular sovereignty, common ownership and social production. A video of the talk can be viewed here, but it is also worth transcribing below Hilary’s discussion of these three principles and how we all need to ‘decommodify our worldview’ and look towards a future that is no longer dominated by the profit motive, which will mark the true liberation of peoples and societies. “…The last thing I wanted to focus on was how we can learn from what people have achieved in other countries around the world in terms of fighting for a better future. Because I don’t know how you feel but for me it feels that we’re constantly fire-fighting, we’re constantly reacting and resisting to the things that they throw at us. If it’s not an austerity programme it’s a bank bailout; if it’s not a bank bailout then it’s another slashing of welfare benefits; it’s another swathe of unemployment coming in from the public sector. If it’s not that it’s a whole raft of other trade deals, it’s another set of austerity measures dropped down on us from the European Union. What we’re saying is that we need a change, so it’s not just about us reacting all the time, but it’s about us putting in place new structures, new ideas and new policies, new thoughts that can challenge that for the future. And we’ve seen that not just in Spain with Podermos rising up, in Greece with Syriza, in all of the great, great election victories that you see in democracies across Western Europe where they are beginning to challenge from the left. But we’ve also seen that in Latin America where social movements have risen up and they have created political challenges to the elite - political challenges which have swept away the old elite, and created completely new dispensations for the future – new ambitions, and new aspirations to try and overcome their past, and to create democratic paths away from capitalism. And that sort of move is what we desperately need here. And you can put that around three basic principles, which when you read all of the different programmes of an alternative from across the world, it always seems to crystallise around three particular things. The first of these is popular sovereignty, and that means reclaiming democracy not just to the national level of governments, which was the thing when we were talking about this 15 years ago and everyone was saying ‘Globalisation is a great threat; we need to reclaim power for our national sovereignty’ – no, we need to take it much, much deeper and restore democracy at its roots; popular sovereignty. And you can look to the examples of those countries like Iceland or Tunisia or Equador or Bolivia, which have completely re-written constitutions in order to be able to give the people’s aspirations top billing. You can also see it in countries like Venezuala where they have local municipal committees, workplace committees, bringing people in to the democratic space and building from the grassroots. You can see it in the economic policies of restoring power to cooperatives and other collective engagements of people, so that they take control of the economic space as well as the political space. So that concept of popular sovereignty could not be more relevant here in Parliament Square, looking across at an institution which denies us that say, it denies us that participation. So I think the first thing we have to work out in our structures [is] how can we reclaim that space. Not just in demonstrations and actions, but much more [in terms of] going through all of the processes that we take part in; whether you’re members of trade unions, whether you’re members of local residents associations, whatever clubs or [forms of] participations you have, pushing that political message through. So, one: popular sovereignty. The second big, big issue here is common ownership. If you don’t own the means of production, if you don’t own the commons, if you don’t own and have rights over public services, you can never turn them back to your advantage. And we know that this is so important because the first wave of enclosures that the neoliberal programme brought in was a new wave of privatisation; privatising water, privatising education, privatising health, privatising anything they can get their hands on and not letting it go back into public hands in the future. And that again is another of the really important threats from these big trade deals. We know already that our government is selling us down the river when it comes to all those things. If we ever get another government in where we want to try and reclaim those powers, if they’ve already been put into a trade deal you can’t get them back. And we want them back, we’ve seen the type of opportunities for common ownership, sharing, and new understanding of the commons where we all participate, we all own it and we all control its future. You see that on the internet, you see that in car pools, you see that in the massive cooperative movement that lives around the world, you see that in workers collectives, the solidarity economy, the social economy, all of these different models which are still going towards the same basic aim of common ownership and control. So number one popular sovereignty, number two common ownership, and the final one is social production. Production not for profit, not so that value can be whisked away by the 1% and stored in their Swiss bank accounts, but production which is there for social need and not treating us as commodities in the system, not treating our public services as commodities, not treating the basic commons that we know and we use as commodities. And that decommodification process starts with each one of us. It starts with our rejection of the logic of capitalism. It says that we want a world that is not dominated by the profit motive. We want a world where we produce things for need, not for profit; for use value, not for exchange.